Robbie Keane this week displayed the sort of attitude that has been lacking in many footballers in recent years and a desperate desire to represent his country. The Republic of Ireland captain butted heads with his club manager Bruce Arena over his release for Wednesday’s friendly with England at Wembley. With LA Galaxy in the middle of a busy period of fixtures in Major League Soccer, the American side’s desire to retain one of their star players outside of an official FIFA window for internationals was perfectly understandable. Indeed, Keane was in top form for the Galaxy in their most recent outing as he netted a first half hattrick and set up another in their resounding 4-0 win over the Seattle Sounders at the weekend. However, Keane has always answered his country’s call and the opportunity to be on the pitch for Ireland’s first game against the “old enemy” since that night in Lansdowne Road back in 1995 was simply too important to miss. It’s very simple. I want to play for my country more than anything and it still means as much to me now as when I made my debut at 18. I can never understand why players don’t want to play for their country, why they won’t turn up or say they are injured. It’s very hard to take in. While Keane hardly set the world alight with his performance against Roy Hodgson’s side, it seems that he will remain one of the first names on the team sheet as long as Giovanni Trapattoni is in charge. The case for Keane’s inclusion is strong, after all he’s the country’s record goal scorer with a very impressive 53 goals in 124 appearances, and Ireland have only lost one game (Russia at home in 2010) when he has found the net. On the flipside, he’s almost 33 and his best days are behind him. My own frustrations with Keane go way back to a World Cup qualifier away to Switzerland in September 2004 when he spent more time trying step overs and throwing his arms up in the air when they failed to come off than anything else. The latter is a trait that has crept into his game and become more noticeable in recent years. The biggest problem for Ireland though is that there aren’t many alternatives should Keane take a back step. While Shane Long once more proved that he is the best option to lead the line, the options to partner him in Trapattoni’s preferred 4-4-2 set up are limited at best with Kevin Doyle out of form, Conor Sammon not up to the standard of international football, and Jonathan Walters and Simon Cox seen as wingers by the manager. The other option of course is to introduce another midfielder, a creative influence like Wes Hoolahan or Jeff Hendrick to play off Long, but it’s not the Trapattoni way and it will take a change of manager before we see a proper shift from the “two banks of four” mentality. Having said all that, there is still a role for Robbie Keane in the Irish set up. He is pretty much the last man standing from the ‘golden generation’ of himself, Shay Given, Damien Duff and the now club-less Richard Dunne, and is still one of the biggest influences in the squad. On Monday we saw just how important an experienced veteran can be when Kevin Phillips came off the bench to fire Crystal Palace to the Premier League from the penalty spot and there is no reason why Keane couldn’t do a similar job for Ireland. There is still an outside chance for Ireland to make next year’s World Cup in Brazil and no doubt Keane will continue to command a place in the starting eleven. A time will come for change though, most likely when Giovanni Trapattoni steps aside, so steps should be taken to plan for life without Robbie Keane and friendlies with Georgia and Spain either side of the qualifier against the Faroe Islands present a perfect opportunity to mix things up a little. 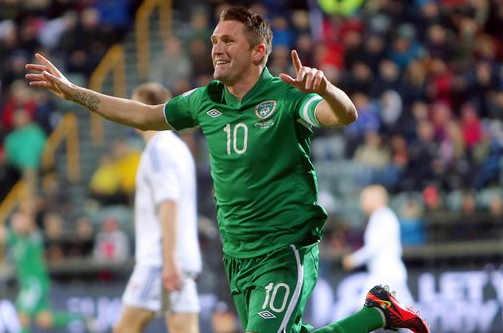 Should Robbie Keane continue to start every game for the Republic of Ireland? No. Should he continue to be part of the squad and used as an impact player? Absolutely. Robbin Kane has to be admired for his patriotic sense as he always wants to put on the green jersey but he is past it. Simple. But I agree with Neil he should be in the squad. Anyone with that much drive to play for his country needs to be in the squad to drive the rest of his team mates on. Long looks our best option but put a playmaker playing off him. The whole country could petition trap for hoolahan but we would just waste ink and paper. Trap is not for changing. Anyone see Robbin Keane as a future Irish manager ? I think that’s where he eventually sees his future after playing.